Photos by Christine Han Photography for Pantry Confidential. Johanna’s feature is a long time coming in so many ways. We first came to know this lovely Swede through her illustrated cooking blog, kokblog. There wasn’t anything like her blog that we were aware of and her whimsical, yet both minimal and instructional, drawings pulled us right in. We couldn’t wait to feature her kitchen after her lengthy house renovation, and boy, does she have a kitchen to show! The clean lines and functional sensibility that are so emblematic of Johanna’s art are on fully display in her Brooklyn home. She is a quiet force to be reckoned with and we can’t wait to introduce her to you - appropriately over fika, a proper Swedish coffee break, replete with warm cardamom buns and strong coffee. Read on to find out how Johanna saves an overly salted soup - plus, a chance to win her latest book, Fika - The Art of the Swedish Coffee Break! Hej Johanna! Please tell us a little bit about your illustrator background. I have been drawing since childhood. My mother (a tailor) and father (an artist) always provided us kids with endless of drawing materials. Even when I have been doing other things for a living, I never really stopped drawing. I had a few shows in the early 90s, mostly painting and sculptures. But later on I got more into design and architecture, which led me back to school. In 2003, I finished my Master of Fine Art and Design at HDK, Gothenburg University. It was really during this time I developed the drawing style I have today. In my last year in school, I met my husband, Marek, and almost immediately after I moved to NYC to work on my final master project (the Promenade, which was a redesign proposal of the High Line in 2003). I paid my tutor in whiskey and Sunday dinners. I have always been baking and cooking, but it was at this time I started to really pay attention to my cooking. In 2005, I started kokblog as a way to collect my recipes. But mostly it was a way to show my work as an illustrator. Today I work almost exclusively with illustrations. My latest architectural project was the redesign of our place in Brooklyn, which I did with my husband. My work also includes pattern design for fabrics and wallpapers, etc. How did Fika the book come about? I met Anna Brones, my collaborator on the book, on Twitter. I think I was responding to an article she had written about her experience of cooking Swedish food in the US (she is American/Swedish). We instantly connected and did a bunch of collaborations together, where she was writing and I was drawing. It was mostly articles about Swedish cooking and baking. One day Anna came up with this great idea to write a book about the Swedish coffee break, fika. Soon after she invited me onto the project. About a year later, Ten Speed Press contacted us and soon after we had a book contract. Despite living several miles away from each other, often on two separate continents, we managed during the year to develop more than 60 recipes together. With the help of constant documentations with notes, photos and drawings on our deeply concealed fika blog, regular emails and weekly Skype calls, we made it all into a book with almost 50 recipes (which are all tested several times). Anna is freelance food writer, lover of coffee, travel and bikes, now living her life in Paris. The recipes in the book are developed and created by both of us. Anna wrote the content and I worked on the illustrations. Anna Brones and Johanna Kindvall enjoying a fika, as illustrated by Johanna. Please walk us through a “typical” thought process for a commissioned project. Do you develop your own recipes? If so, do you cook or draw first? When I work on a commission, I carefully listen to the client's needs, likes or what they have in mind. Some clients are more precise than others. My job is to translate their needs and vision into an illustration or graphics. Most of the recipes on kokblog are developed by me. It could be based on a classic or something new I want to learn more about. It's food I want to eat regularly at home. Most of my ideas comes from what I eat at dinner parties, restaurants and when traveling. But food blogs, social media, magazines or cookbooks are also great sources for inspiration and a great way to learn new methods. I most always cook first (many of my recipes are created with the things I happen to have in my fridge). But sometimes I start by doing research in cookbooks and online. Then I often sketch the recipe simply on a piece of paper or in my recipe book (a combination of sketches and notes). But it's always the flavors and the method that decide the recipe - not how it will look in a drawing. Johanna takes us behind the scenes in her brightly lit studio, sharing the process of idea conception, sketches and ultimately, computer-assisted rendering. How has your Swedish background influenced the way you cook and eat? Obviously my Swedish background reflects my cooking but it constantly changes, depending on where I am and what's in season. I grew up in the countryside in Sweden where most people cooked traditional Swedish food. My parents used to live in Spain before I was born so the cooking in our home wasn't always that traditional. But like all Swedes, we had meatballs, falukorv, pea soup and knäckebröd regularly. My parents also took us for a walk in the woods every Sunday. During the summer and autumn, we would forage berries (for jam), mushrooms and herbs (for snaps). For example, my mother would make elderflower cordial, lingonberry jam, pickled gherkins, black currant juice, raspberry jam and strawberry jam to stock up in her cellar. Blueberries she always froze to use for tarts and as topping for ice cream. My mother also made her own sausage, especially liver sausage. What do you like to make for yourself after a full day of drawing and illustrating? I love carbonara. But if I want something lighter, I sauté mushrooms which I serve with pasta or my husband's flavorful brown basmati rice (he makes it in the pressure cooker with bay leaves). For lunch I make different kinds of salads, noodles (in homemade broth), or dal and eggs. Which do you prefer to cook/eat/draw: sweet or savory? Funny enough I'm more of a savory person than sweet. But baking is for sure my absolute favorite thing, especially bread baked with wild yeast. Obviously I love drawing food but I also really like to draw the tools in cooking. One of the most fun jobs in my past was when I got to draw machines for chocolate making for an article in Art of Eating. Last summer I visited a winery in Sicily. It was fascinating as they are using both new and old technology. One day I'm hoping to have time to draw all the different types of barrels and machines in winemaking. It would make an interesting post or article, I think. My favorite comfort food growing up was probably köttfärssås, which is a simpler version of Bolognese. Today I really like Äggakaka (eggy cake), which is a southern Swedish thick pancake-like egg dish you make preferably in a cast iron pan. It's served with lingonberries and salted pork (bacon). If go locally here in Clinton Hill, I really like Aita, The Finch and Locanda Vini & Olii. Play out your ideal dinner party for us: the mood, decor, music, guests and obviously, food! I often start the dinner with drinks (cocktails by my husband or wine depending on the food) with freshly baked bread, accompanied by hors d'oeuvres. Everyone is mingling around in the kitchen snacking and getting to know each other. Often we have world music (P1 världen, Swedish radio online) in the background, classical music or jazz. Some of the guests may know each other but we often try to have a mix. Sometimes we haven't even met everyone. Sometimes we have a small talk before a dinner; it could be an artist who presents their latest work, for example. I'm a lazy decorator, so the table is often set in front of my guests. Sometimes it's even occupied with freshly made pasta that will be cooked while the guests are sitting down and the main course wine is served. For dinner I like serving my latest projects. It can be as decadent as pheasant filled with marinated cranberries or just a hearty stew with fresh pasta. The most important thing is for us is to meet our friends, get to know new ones and have inspiring conversations. Dessert is most often something that goes into the oven while we eat dinner. My specialties are tarts and pies. It's simple and can be endlessly varied both with the filling and the crust. Lately I have been doing chocolate mousse. Incredible pendant lighting by Tom Dixon. 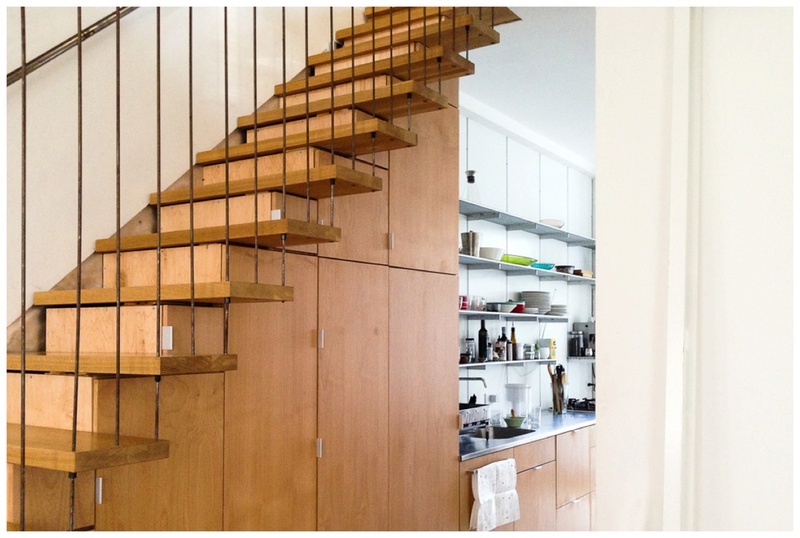 Space under the stairwell doubles as seamless - and clever! - custom cabinetry for kitchen storage! I love everything about my kitchen. I guess that's the beauty of designing it yourself. But I think the function of it is what I like the most. How everything works in the way I cook and bake. But all of this is based on experience of designing and working in many different kitchens. For example, I like my Swedish country kitchen but it's not as good as this one. We made a few mistakes there. Mistakes that we learned from and that were very useful when we planned this one. One thing I'm not totally happy with is the kitchen sink faucet. It's gorgeous but when you rinse vegetables it actually splashes water everywhere. It is especially annoying when you get soaked in water just before dinner guests arrives. But funny enough, you get used to it. Homemade bread and antipasti helped fuel our shoot: mushroom confit, marinated sun-dried tomatoes (recipe to come soon on kokblog), a rye sourdough loaf and a Swedish rye bread known as rågbröd (recipe can be found on page 148 in the book). My bread knife. I like it so much I got one for my tiny cottage kitchen in Sweden. Also I love my classic almond mill I found at a flea market in Sweden. I wish I had a butcher, fish monger, cheese shop and vegetable shop around the corner, as I really do prefer small food specialty shops to larger food chains. But we have a few: Victory Garden is one of them; they mostly have produce from local farmers, etc. I get my chicken there, which tastes and looks like a real chicken, small and absolutely delicious. It comes with the head and feet, which makes for a wonderful stock. They also have cheese, bread, dairy and pastries. And I love Sahadi's (where I get feta, olives, nuts, dried fruits, halva, salt licorice, olive oil, tea and spices) and the farmers markets for vegetables. My sourdough starter. I bring it everywhere I go in the world (on flights it travels in a traveling bottle made for shampoo). Dried chickpeas, lentils, dal, rice, semolina and polenta. Fennel, garlic, carrots, celery, ginger and onions. Whole ancho chilies, Aleppo pepper, cumin, coriander, mustard seeds, anise seeds, caraway seeds and cardamom. Salt. Tahini, flours (rye, wheat, etc.). I like to share my experiences in the kitchen so no direct secrets here, unless I'm told to be quiet when testing and developing recipes, for me and others. Not sure if this is unexpected: In beef stews I like to use a combination of whole ancho chili (soaked in hot water before chopped and added to the stew), licorice root and chocolate (the cocoa powder is added at the end). Would you believe this small jar contains homemade dehydrated yeast? Because why wouldn't you dehydrate your own yeast! I love Elizabeth David's books. And the book Roast Chicken and Other Stories by Simon Hopkinson with Lindsey Bareham, illustrated by Flo Bayley. I have many food blog favorites, hard to say which I like the most. But here are a few sites I visit regularly: Hunter Angler Gardener Cook, Rachel Eats, Elizabeth in Rome, London Eats (excellent cookie maker), Bread Magazine, Plated Stories by Ilva Beretta and Jamie Schler, and Cook's Illustrated. Guilty pleasure ingredient, food product, or dish? I sometimes crave hotdogs but not the American ones, the thick Swedish ones (tjock korv med bröd). I don't think it's a great sausage in any way (my husband really hates them) and the bread that comes with it is really terrible. But I enjoy it enormously once or twice a year. And I will always have it with ketchup, a product I never ever have in my kitchen. Instead I make a thick tomato & chili sauce to serve with my fresh sweet Italian sausages, which are excellent with mustard as well. Madame Fromage's! I'm sure there will be loads of nice cheeses and complementary items in her pantry. I really enjoy her blog; it's mouthwatering and well-written. I have a background as a social worker and I learned to improvise in the kitchen by cooking with drug addicts. For some years, I trained people in a large kitchen in Malmö, serving lunch and fika for 20 to 30 guests every day. It was a challenge and I learned what to do when a dough couldn't keep together and how to save overly salted stews (simply add more vegetables and liquid). Reprinted with permission from Fika, by Anna Brones and Johanna Kindvall, copyright © 2015, published by Ten Speed Press, an imprint of Penguin Random House LLC. Illustrations copyright © 2015 by Johanna Kindvall. Bullar (buns) are perhaps the quintessential component to a Swedish coffee break, and vete in Swedish means “wheat.” Vetebullar is therefore the general term for wheat-based dough that can be turned into any number of bun creations. Kanelbullar (cinnamon buns) and kardemummabullar (cardamom buns) are common variations on this type of bun, and while the traditional “roll” form is common, there are twisted varieties as well. Typically they are baked and served in paper liners. Kanelbullar are such an iconic pastry that an entire day in Sweden is devoted to them (October 4, for those considering celebrating). This recipe has both filling varieties, and once you’ve mastered the dough, you can start experimenting with your own fillings. If a Swede knows one thing, it’s this: no matter what the variation, bullar are always best fresh out of the oven, and make for a wonderful-smelling kitchen. To prepare the dough, melt the butter in a saucepan; then stir in the milk. Heat until warm to the touch (about 110°F/43°C). In a small bowl, dissolve the yeast in 2 to 3 tablespoons of the warm mixture. Stir and let sit for a few minutes until bubbles form on top of the yeast. In a large bowl, mix together the flour, sugar, cardamom, and salt. Add the yeast mixture along with the remaining butter and milk. Work together with your hands until you can make the dough into a ball. Transfer the dough to a flat surface and knead it until smooth and elastic, 3 to 5 minutes. The dough should feel moist, but if it sticks to your fingers add a tiny bit of flour. The dough is fully kneaded when you slice into it with a sharp knife and see small air bubbles throughout. Return the dough to the bowl, cover with a clean tea towel, and place in a draft-free place to rise until doubled in size, about 1 hour. Grease a baking sheet, or place medium paper liners directly on the sheet. Make the filling right before the dough has finished rising. Using a fork, cream the butter together with the sugar and the spices until you get an evenly mixed, spreadable paste. The same base dough recipe can be used to form small individual buns or a single, larger loaf (also known as "length"). When the dough has finished rising, take half of the dough and place it on a flat surface. Roll it out with a rolling pin to an 11 by 17-inch (28 by 43-centimeter) rectangle. Place the rectangle on the surface so that the long side is closest to you. Carefully spread half of the filling on top of the rolled-out dough so that it covers the entire area; be sure to go all the way to the edges. Begin at the long side near you and roll the dough upward (see diagram). Slice the roll into 15 to 18 equally sized slices and place them, rolled side up, on the baking sheet or in the paper liners. If using a baking sheet, pinch the ends of the slices to keep them from pulling away during baking. Repeat with the second half of the dough. Cover the buns with a clean tea towel and let rise for 45 minutes. When the buns have risen, carefully brush them with the beaten egg and sprinkle each with the pearl sugar. Bake for 8 to 10 minutes. If you are baking a length, bake for an additional 10 minutes. Remove from the oven, transfer the buns from the baking sheet to the counter, and cover with a tea towel to cool. Serve freshly baked, and if not eaten right away, store in the freezer once they are completely cooled. VARIATIONS: Instead of rolling the dough to make the classic bun shape, you can also make twists (see diagram above), a common formation when making cardamom buns, as well as baking a length and cutting a design into the dough with scissors to let the filling ooze out a little (see below). Just look at these little beauties! For your chance to win a copy of Johanna's newest book, Fika - The Art of the Swedish Coffee Break, please leave a comment below. You have until Friday, June 12, 11:59pm/EST, to enter. Winner will be chosen at random - good luck! *Photos by Christine Han Photography for Pantry Confidential. All photos on Pantry Confidential are original unless otherwise indicated. Please credit and link back to our site when using our images, thank you.